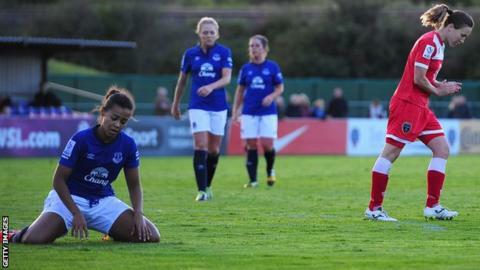 Everton's 21 years as a top-flight women's team could be ended when they face Notts County on Sunday. Bottom of the Super League and without a win all season, the Toffees are seven points below second-bottom County with just three games remaining. "Our chances of staying up are very slim," admits manager Andy Spence, "but we owe it to the great history of this club to battle right to the end." Spence and his team have been battling against the odds to keep the club in the elite division and so preserve that history. Everton's demise has been played out alongside the rise of the WSL and the influx of money into clubs such as current leaders Chelsea, reigning champions Liverpool and Manchester City, who are in their first season of top-flight football. The Toffees have not received the same financial support from their parent club, with the perhaps inevitable result of key players leaving. "In the last couple of seasons we've lost a mass of experienced internationals," noted Spence, "players who have left to earn decent money and play full-time." Everton are still a part-time club and the manager added: "We haven't got the resources to go out and spend thousands of pounds on players." An illustration of just how badly the player exodus has hit Spence's side is last week's starting line-up against Manchester City - only two of the players had also started in the 2010 FA Cup final win against Arsenal. Unfortunately for Spence in particular, the departures began in earnest just as he took over from previous manager Mo Marley in November 2012. Four England internationals - Fara Williams, Natasha Dowie, Becky Easton and Lucy Bronze - left for Merseyside rivals Liverpool and helped the Reds win the league in 2013 after they had finished the previous season bottom of the table. Two more England regulars, Jill Scott and Toni Duggan, switched to Manchester City ahead of the current campaign. In all, nine players who were part of the squad that won the 2010 FA Cup and reached the following season's Champions League quarter-finals are now at other Super League clubs. But Spence, formerly Marley's assistant and an Everton coach since 2004, refuses to make complaints or excuses. "I knew when I took over that it was on the cards that players would be leaving," he said, "but I accepted the challenge. "We've replaced the players who've left with younger, less experienced players, but this club is renowned for bringing through quality youngsters and the group we have right now is very talented. "I couldn't have asked any more of them this season in terms of their desire and commitment, and apart from a couple of games we've played well. "We've deserved better results from the performances we've put in, but the league table doesn't lie and we know the odds are stacked against us now." It will be a sad day for the blue half of Merseyside if the team that were top-flight champions in 1998 - and who have also won the League Cup as well as the FA Cup in the last six years - do indeed drop into the WSL's second tier. But Spence, whose team were FA Cup runners-up to Arsenal this year despite their league woes, said defiantly: "If we do go down it will just be a step backwards to come back forwards. "But don't write us off yet. We reached the FA Cup final and bad teams don't get to the final - and by the way we beat Notts County in the semi-final. "So we'll go to their place on Sunday believing we can beat them again, then win our last two games [away to Chelsea and Arsenal] and hope that other results go our way. It's a long shot, but we'll be giving it our best shot."